A stylish traditional rectangular single ended bath from period bathroom specialists Old London. Inspired by the Art Deco movement, the Ascott range with it's clean classical design blends beautifully with any traditional bathroom decor. Use in conjunction with Old London's range of bath screens and bath panels for a glorious new traditional bathroom. Q. this bath will replace existing bath currently fitted with shower mixer taps - look similar to your traditional shower mixer taps. Can these be fitted on this bath? Hi, this bath comes without any tap holes and is designed to be used with wall mounted taps as shown in the pictures. I hope this is some help, please et me know if you have any further questions, thanks! Q. Does this bath come with panels? Hi, this product does not come with panels. You may wish to look at Part No NLP505 and Part No NLP511, as these may be appropriate. Thanks! 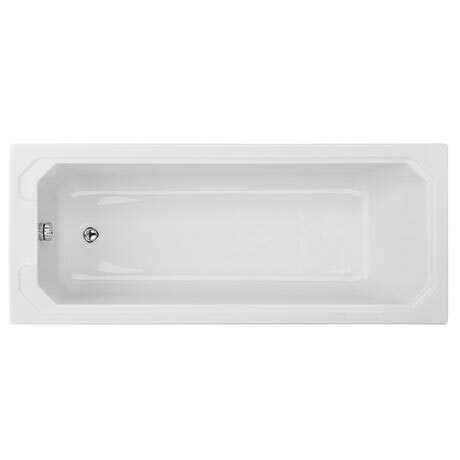 Q. Hi - is this bath suitable for a built in setting ? Hi Gus, this product is suitable to have panels fitted all around if that is what you mean. Please let me know if you have any further questions. Hi,, this bath is 5mm thick acrylic and should be fine to accommodate a shower above it. Hope this helps! Q. DOSE THIS BATH COME WITH LEGS AND FRAME? Hi Dawn, yes the Old London Ascott Bath comes with a cradle and legs/ I hope this helps!